Background Large vessel occlusive disease portends a poor prognosis unless recanalization is rapidly achieved. Endovascular treatment is typically performed via a transfemoral approach, but catheterization of the occluded vessel can be problematic in cases of extensive vessel tortuosity. Methods A retrospective review of a prospectively maintained database identified 7 patients who underwent acute endovascular reperfusion therapy via transcervical approach. Results We identified 7 patients. Admission NIHSS ranged from 8–27 and recanalization occurred between 7–49 min of carotid access. Prior to carotid access, 20–90 min were spent attempting target vessel catheterization via the transfemoral approach. All occlusions were in the left MCA. In 87.5% of patient, TICI2b/3 recanalization was achieved. Neck hematoma formation occurred in one case requiring elective intubation. At 2 months followup, all patients had survived with mRS 0–4 except for one patient who had a large infarct despite recanalization. Conclusions Transcervical access for acute ischemic stroke leads to rapid and high quality recanalization. Future studies will focus on improved hemostasis and early identification of patients who would benefit the most from direct carotid access for acute stroke. Mechanical thrombectomy is an important alternative strategy to restore flow, particularly in large vessel occlusive disease. The benefit of intra-arterial approaches, however, is negated by long delays in achieving reperfusion.2 ,3 Numerous barriers can lead to delayed revascularization including the logistics of patient transfer and the use of time-consuming advanced imaging. The standard endovascular approach to acute stroke intervention is the common femoral approach. The preference for this approach is related to the compressibility of the right common femoral artery, the potential for less dire consequences in case of femoral artery injury compared to carotid artery injury and to the fact that via this approach all brachiocephalic vessels can be catheterized and thus multiple potential sites of occlusion (eg anterior vs posterior circulation) can be accessed. Age and traditional cerebrovascular risk factors promote the elongation and tortuosity of the femoral, iliac, aortic, brachiocephalic and cervical arteries. Additional challenges in catheter navigation include thoracic aortic aneurysms and severe thoracic aortic atherosclerosis. Therefore once groin access is achieved, procedural times may be significantly prolonged in cases of difficult anatomy.4 In this study, we present 7 cases in which the target vessel could not be quickly catheterized via the transfemoral approach necessitating alternative access via a trans-cervical approach. Patients were selected for endovascular therapy based on clinical syndrome (NIHSS>8) with suspected large vessel occlusion and radiographic evidence of well-preserved parenchyma (CT ASPECT score of 7 or greater and MRI ASPECTS of 6 or greater). All procedures were performed with minimal conscious sedation (utilizing dexmedetomidine, fentanyl and versed as needed) to permit serial neurological assessment. After transfemoral access was achieved, the target vessel could not be accessed with a base catheter. In one case, the transfemoral approach was not attempted as primary access modality due to the extreme vessel tortuosity observed on CTA. In all cases, numerous wires could not be passaged distally in the common carotid to permit exchange of the diagnostic catheter for a shuttle sheath. After at least 20 min of procedural time, the transfemoral approach was abandoned and a transcervical approach was pursued. Patient features are summarized in table 1. In all cases, recanalization (TICI 2A-3) was achieved and in 87.5% patients recanalization TICI 2B-3 was achieved with procedural times ranging from 7–43 min. An octogenerian presented with wake up symptoms of language difficulty and right sided weakness. Initial clinical examination fluctuated between an NIHSS of 3 to 5 with admission MRI head revealing no evidence of infarct. The patient was managed conservatively but subsequently developed worsening and persistent symptoms with an NIHSS of 10. MRA head revealed a left M1 occlusion and the patient was taken for angiography. Catheter based angiogram confirmed a left M1 occlusion. A 5Fr Simmons catheter was used to access the proximal left common carotid but could not be tracked further distal. Multiple catheters and wires were unsuccessful in achieving distal access. After 30 min of attempted catheterization, direct carotid access was attempted and successfully achieved. Successful recanalization with MAT (058 Navien catheter) was achieved 19 min after carotid access. Access site closure was attempted with deployment of a Mynx closure device. This was unsuccessful and resulted in a neck hematoma. An angiogram revealed contrast extravasation at the cervical puncture site. At this point, manual pressure was applied for a total of 30 min and the patient was electively intubated for airway protection. A follow up CTA of the neck revealed no pseudoaneurysm and the hematoma was managed conservatively. The patient was successfully extubated and discharged to a rehabilitation facility. A post procedural MRI head revealed an infarct volume of 24 cc (figure 1C). At 3 months, the patient was ambulating independently with improved language. 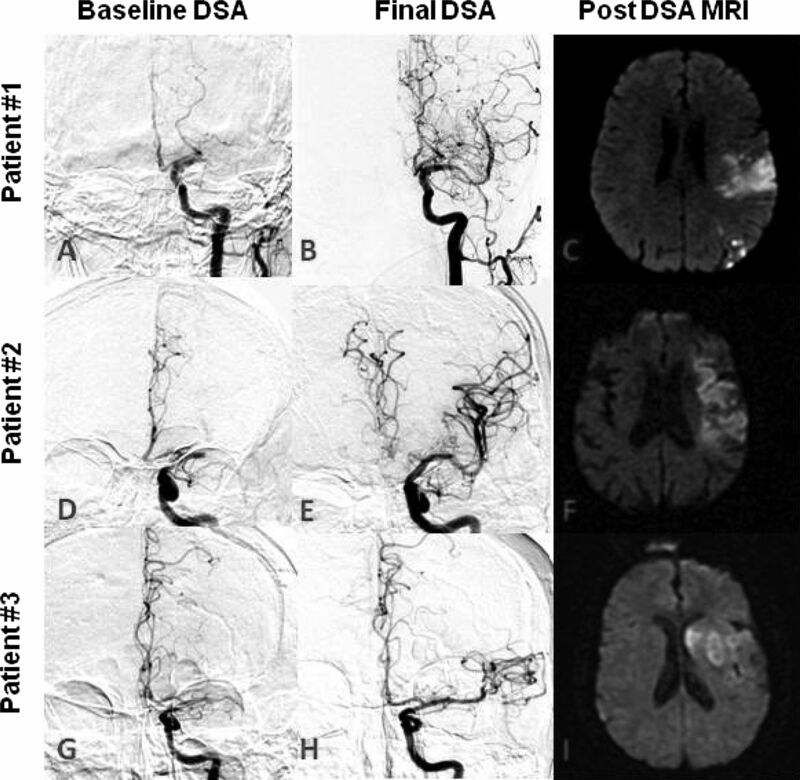 AP projection of the intracranial vasculature on digital subtraction angiography at baseline (Case #1, panel A; Case #2, panel D; Case #3, panel G) and after thrombectomy (Case #1, panel B; Case #2, panel E; Case #3, panel H). Diffuse restricted weighted imaging MRI reveals the final infarct distribution and volume (Case #1, panel C; Case #2, panel F; Case #3, panel I). An octogenerian presented with sudden onset of right sided weakness and language difficulty. Examination revealed an NIHSS of 27. CTA of the head revealed a left M1 occlusion with pre-procedural MRI head revealing a small left frontal infarct. The patient presented outside the IV tPA window and endovascular therapy was pursued. A diagnostic angiogram was performed with a 5 Fr Simmons catheter but the target vessel could not be catheterized after 20 min of procedural time. Carotid puncture was achieved after 13 min of attempting cervical access and recanalization with MAT (072 Navien catheter) was achieved 7 min after carotid access. Access site closure was again attempted with deployment of a Mynx closure device followed by manual compression. The patient was quite agitated and did not tolerate manual compression. We maintained a 5 Fr catheter in the left common carotid to perform serial angiographic runs to confirm resolution of contrast extravasation. After 30 min of manual compression, contrast extravasation had subsided. A follow up carotid ultrasound the following day revealed no carotid pseudoaneurysm. A post procedural MRI head revealed an infarct volume of 24 cc (figure 1F). At 3 months, the patient was ambulating with assistance and had improved language function. An elderly patient with a history of hypertension and diabetes presented with wake up symptoms of language difficulties and right sided weakness (NIHSS 9). CT head revealed good preservation of the parenchyma (ASPECT score of 9) and CTA head revealed a left M1 occlusion. Extensive attempts to catheterize the left common carotid were unsuccessful with multiple catheters via the transfemoral approach. After 70 min of procedural time, the decision was made to pursue supra-aortic access. TICI 2b recanalization was achieved with two passes of manual aspiration (058 Navien catheter) 45 min after carotid access was established. Successful hemostasis was achieved with manual compression of the carotid access site for 30 min. A post procedural MRI head revealed a 21 cc infarct (figure 1I). At 3 months, the patient was non-ambulatory but had improved language function. An elderly patient presented with an NIHSS of 22. CTA of the head and neck revealed a left terminal internal carotid artery occlusion. Patient was not eligible for intravenous thrombolysis. After 90 min of attempted transfemoral carotid access through a bovine type III aortic arch (see figure 2A), direct carotid access was pursued. A 5F sheath was placed, through which a 4.3 DAC was advanced for attempted manual aspiration. The clot burden was however too large and could not be aspirated. After 3 passes with the Trevo device, recanalization was achieved (TICI 2a). No local complications was observed at the puncture site, however the patient finally developed a large infarct and died during the hospital stay. AP projection of the aortic arch on digital subtraction angiography. A: A bovine type 3 aortic arch limited target vessel catheterization in Case #4. B: Insufficient angulation lead to inadvertent placement of the sheath in the caudal direction in Case #5. An octogenerian with a history of hypertension and coronary artery disease presented with wake-up symptoms of right sided weakness and language difficulty at an outside facility and transferred for further evaluation. On arrival, the patient had an NIHSS of 20 with a CTA head and neck revealing a left M1 occlusion. Because of an extremely tortuous aortic arch observed on the initial CTA, a transcervical approach was directly undertaken. The target occlusion was accessed 10 min after puncture and recanalization (TICI 2b) was achieved after 3 passes of the Trevo device. Total procedure time was 40 min. The 5F sheath was removed and manual compression applied for 20 min. Carotid ultrasound confirmed absence of hematoma or common carotid damage at puncture site. No other complications were observed. At 3 months the patients had a mRS of 2. An octogenerian with a history of atrial fibrillation presented with sudden onset of right sided weakness and language difficulty (NIHSS 21). IV thrombolysis could not be administered due to dabigatran usage. A CT head revealed a hyperdense left MCA with minimal ischemic changes (ASPECT 8). Despite 90 min of attempted catheterization, the target lesion could not be accessed leading to a transcervical approach. After 8 min of carotid access, the left MCA artery was recanalized with a single pass with manual aspiration thrombectomy resulting in TICI2b flow. Carotid access hemostasis was achieved with manual compression for 20 min without neck hematoma formation. At 3 months, the patient had improved language but did require assistance for grooming and ambulation. Persistent large vessel occlusive disease is associated with high rates of mortality and morbidity. Difficult catheter access can lead to lower rates of recanalization and ultimately poor clinical outcomes. Transcervical access has been a successful alternate strategy for carotid stenting7 and aneurysm coiling.8 In this study, direct percutaneous puncture and catheterization of the common carotid artery was instrumental in achieving rapid and successful revascularization in the case of acute stroke intervention. In a recent analysis of 130 patients undergoing endovascular procedures for acute stroke, 5.1% of the patients could not be successfully catheterized via transfemoral access.4 These patients had low rates of recanalization (14.3% vs 80.5%) and less good outcomes (0% and 36%). Recanalization in patients with good catheter access occurred with a median time of 20 min from groin puncture, whereas patients with high vessel tortuosity had greater than 30 min delay in catheter delivery to the target vessel. While the transfemoral access remains the preferred approach in most cases, understanding the predictors of difficult access is critical in triaging the patients who may benefit the most from an alternative approach. In our series, an additional 20–90 min of procedural time was spent attempting to achieve catheterization via the transfemoral approach. Identifying these patients as poor candidates for the transfemoral approach at an earlier timepoint may have prompted a transcervical approach as the initial strategy and faster onset to treatment time. Predictors of difficult catheter during acute stroke include hypertension, hyperlipidemia, advanced age (>75 years of age) and left anterior circulation stroke.4 The seven patients in our study all had left MCA occlusions and most patients were older than 75. In a recent review of 1067 consecutive carotid stenting procedures, 90% were achieved via a femoral approach. An additional 9% were treated with a transbrachial approach. The remaining 10 cases (0.9%) could not be catheterized with either approach but were successful with a transcervical approach.7 The lesion was in the left carotid in 70% of the cases, again highlighting the challenge of catheterizing the left side. The transfemoral approach has been associated with increasingly fast rates of groin access to recanalization, particularly with the advent of stentrievers. A recent comparison of various endovascular modalities revealed groin to recanalization time of 36±18 min for stentrievers compared to 92±67 min for intra-arterial thrombolysis and 114±57 min for the Merci device.9 In our cases series, once transcervical access was achieved, recanalization was similarly observed at ultrafast rates (25±14 min). In the case of patients 2 and 7, it took only 7–8 min to achieve recanalization. The proximal access saved time by not only bypassing the tortuous arch but also establishing better support and ease of access to the lesion. For the cases of manual aspiration, we suspect the proximal support also aided in a stronger aspiration effect. While transcervical access may facilitate faster and higher rates of recanalization in a subset of patients, many challenges remain. We had difficulty achieving hemostasis in one patient with resultant neck hematoma. This led to elective intubation for airway protection although surgical hematoma evacuation was not necessary. Previous series have reported a 4–7% rate of neck hematoma after sheath removal.10 Several factors likely influenced the formation of a neck hematoma in our series. First, we commenced all our interventions with minimal conscious sedation to permit continuous clinical assessment during the procedure. However, manual compression was not well tolerated in two of the wake patients and this lead to difficulty in achieving continuous compression. In subsequent cases, additional sedation was administered during closure to minimize patient movement. Secondly, access was achieved with a percutaneous approach. An open surgical exposure, however, may be superior in achieving hemostasis as it mitigates the need for manual compression or a closure device.11 Open surgical exposure, however, may not be readily feasible in the acute stroke setting. Finally, we utilized the Mynx closure device without good success for carotid artery closure. In general, it would be reasonable to expect that anticoagulation use may lead to high risk of hematoma formation but in 2 cases, the concomitant use of intravenous thrombolysis (case #5) or oral anticoagulants (ie, dabigatran) (case #7) did not result in neck hematoma formation while achieving hemostasis with 10–20 min of manual compression. The use of intra-arterial thrombolysis also appears to be safe with adequate hemostasis during closure. Despite the associated complications, we observed good quality of recanalization with low final infarct volumes and high rates of survival that exceed those expected for this age group. One can speculate that a primary access approach in these patients without the significant delay posed by the transfemoral approach attempts may have led to even better outcomes. Successful endovascular therapy for acute stroke relies on a systems approach to reducing times at each step.14 Difficult catheter access of the target vessel can limit successful and timely recanalization in a subset of patients. In this preliminary series, the transcervical approach proved to be a feasible and efficacious strategy to achieve fast recanalization once the carotid artery was accessed. Future studies will focus on early triage of patients most likely to require alternative access to further limit procedural times as well as improving methods of achieving hemostasis.
. Time to treatment with intravenous tissue plasminogen activator and outcome from acute ischemic stroke. JAMA 2013;309:2480–8.
. Endovascular therapy after intravenous t-PA versus t-PA alone for stroke. N Engl J Med 2013;368:893–903.
. Impact of onset-to-reperfusion time on stroke mortality: a collaborative pooled analysis. Circulation 2013;127:1980–5.
. Difficult catheter access to the occluded vessel during endovascular treatment of acute ischemic stroke is associated with worse clinical outcome. J Neurointerventional Surg 2013;5 1):i70–3.
. Manual aspiration thrombectomy: adjunctive endovascular recanalization technique in acute stroke interventions. Stroke 2012;43:1408–11.
. Final infarct volume is a stronger predictor of outcome than recanalization in patients with proximal middle cerebral artery occlusion treated with endovascular therapy. Stroke 2012;43:3238–44.
. The clinical results of transcervical carotid artery stenting and frequency chosen as the approach route of carotid artery stenting in 1,067 consecutive cases. Acta Neurochirurgica 2013;155: 1575–81.
. Direct carotid puncture for the endovascular treatment of anterior circulation aneurysms. AJNR Am J Neuroradiol 2006;27:1502–4.
. Stentrievers versus other endovascular treatment methods for acute stroke: comparison of procedural results and their relationship to outcomes. J Neurointerventional Surg 2014;6:265–9.
. Direct cervical arterial access for intracranial endovascular treatment. Neuroradiology 2006;48:925–9.
. Intracranial angioplasty and stenting through direct carotid puncture. J Neuroimaging 2013;23:207–10.
. Hemostatic closure device after carotid puncture for stent and coil placement in an intracranial aneurysm: technical note. AJNR Am J Neuroradiol 2002;23:978–81.
. Choice of access for percutaneous carotid angioplasty and stenting: a comparative study on cervical and femoral access. J Cardiovasc Surg (Torino) 2009;50:677–81.
. "Picture to puncture": a novel time metric to enhance outcomes in patients transferred for endovascular reperfusion in acute ischemic stroke. Circulation 2013;127:1139–48. Contributors Author contributions to the study and manuscript preparation include the following: Conception and design: all authors. Acquisition of data: all authors. Analysis and interpretation of data: all authors. Drafting the article: all authors. Critically revising the article: all authors. Reviewed submitted version of manuscript: all authors. Approved the final version of the manuscript on behalf of all authors: all authors. Administrative/technical/material support: all authors. Study supervision: all authors. Competing interests TJ has received consulting and speaker fees from Co-Axia, ev3, Concentric Medical, and Micrus. Ethics approval University of Pittsburgh, IRB.